2009 Gibson Custom Shop Pearly Gates Aged/Signed 1959 Les Paul! THE guitar for a lot of Burst aficionados! It's the Gibson Custom Shop Reissue of Billy Gibbons' 1959 Les Paul affectionately known as "Pearly Gates." This has to be one of the best examples out there as it's the Murphy Aged and SIGNED version, unplayed condition, with every single piece of case candy and then some (including ORIGINAL RECEIPT! ), with a KILLER (attractive) vintage top, and super lightweight! Plays and sounds incredible too! One of the finest examples you'll ever find, look at this thing! Please check my website for full details. The story of how Gibbons acquired ‘Pearly Gates’ is almost as famous as the guitar itself. As told by the Reverend Willie G. himself, the story begins in the late 1960s with an old, beat up Packard automobile that used to be ZZ Top’s main ride – all three of them and their entourage. “That automobile served us well,” Gibbons said. “It was huge, flashy and lowered, but not intentionally – it was just, plain old.” Not long after getting the Packard, one of band’s “girlfriends” decided to head to California to try out for a part in a movie, and the band was kind enough to let her use the Packard to get there. According to legend, she landed the part, and the band christened the car with the name "Pearly Gates" because they thought “it must have had divine connections.” At some point, the girlfriend sold the car and sent the money back to the band. “The very day the money arrived, a guy called me up wanting to sell me a ’59 Sunburst Les Paul,” Gibbons reflected. “I bought the guitar and called the girlfriend to thank her for being so kind. She said, ‘It looks like the car went for a good cause. Since the money that put the guitar in our lap came from selling the Packard, we'll lay claim to the name Pearly Gates. Now you can go make divine music.’ Try as I may, I haven't been able to find another guitar that sounds as heavenly.” And that’s the legend of Gibbons’ storied ‘Pearly Gates’ Les Paul. Gibson’s 1959 Les Paul Standards may be the Holy Grail of electric solid body guitars, but Gibbons’ ‘Pearly Gates’ may be the most desirable of all. The master craftsmen at Gibson Custom have waited a long time for the opportunity to recreate Gibbons’ famed ‘Pearly Gates.’ So when they finally got their chance this year – the 50th anniversary of the 1959 Gibson Les Paul Standard – they set out to make the best possible replica they could. Suffice to say, they have succeeded … and rather gloriously! Recreating one of the world’s most coveted guitars wasn’t easy. But remember, we’re the original makers of the guitar, and we are Gibson Custom! 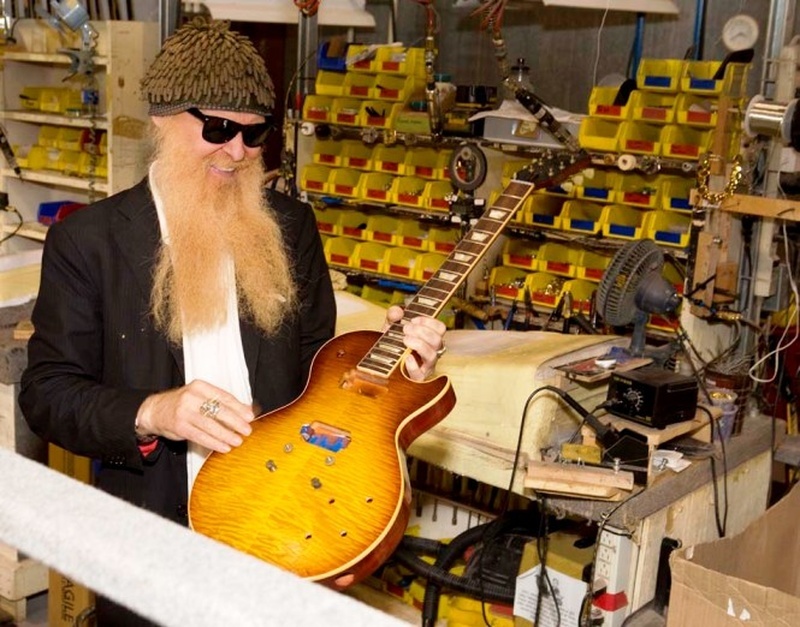 The new Billy Gibbons ‘Pearly Gates’ Les Paul is as close as it gets to owning the real thing. And it all starts with the traditional marriage of select tonewoods that make up Pearly Gates’ body – a solid, non-weight relieved mahogany back topped with a hand-carved figured maple top that was carefully selected especially for Gibbons’ Pearly Gates model. 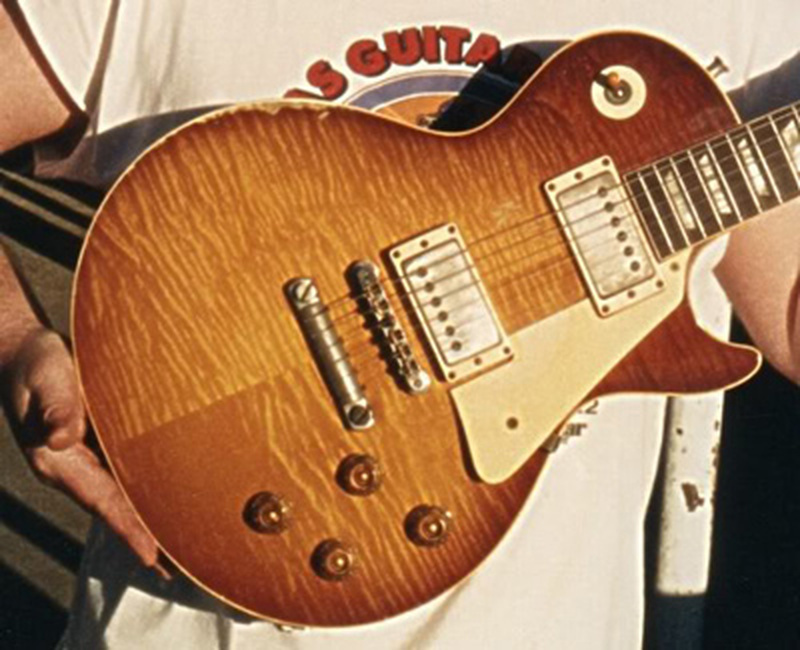 The maple tops from the late 1950s and early 1960s remain one of the Les Paul’s most distinguishing features, and the tops selected for the Billy Gibbons ‘Pearly Gates’ are as beautiful and figured as the one that adorns the original. Single-ply cream binding surrounds the top of each guitar, helping to protect its edges but also adding a touch of elegance that remains a fundamental part of Gibson’s rich guitar-making history. One of the more storied aspects of Gibson’s legendary Les Pauls of the late 1950s were the variations of the initial Billy Gibbons Burst finishes applied to them. Because of an inconsistency in the initial batch of red paint, the finished color had a tendency to fade when exposed to the elements. Of course, the amount of fading was determined by each guitar’s exposure to the elements, resulting in several improbable variations of the same finish. On Billy Gibbons’ celebrated Pearly Gates, the finish has darkened somewhat around the edges, but the beautiful grain of the figured maple top comes through prominently all the way around the guitar. The master craftsmen at Gibson Custom have successfully recreated this subtle variation on the new Billy Gibbons ‘Pearly Gates’ Les Paul, even down to the original’s distinct red mahogany back. Granted, no two guitars can ever possibly have exactly the same top and finish. But this may be as close as it gets. In the almost 40-plus years that Billy Gibbons has been making music, he’s done everything in his power to preserve and maintain his signature ‘Texas Blues’ sound. In a recording studio, it’s easy: he just breaks out the original ‘Pearly Gates’ – as he’s done for every ZZ Top album to date – and just wails away. On the road, however, Billy doesn’t turn to ‘Pearly Gates,’ but rather a close copy of the original. To replicate his studio tone in a live setting Billy turned to Seymour Duncan, who after carefully examining and analyzing the original pickups developed the appropriately named Pearly Gates humbuckers, which are as close to sonically matching the original pickups as anyone will ever get. The results are truly amazing. These popular conduits of tone – used by such brilliant players as Dickey Betts and Warren Haynes – are slightly hotter than your normal, everyday humbucker. According to the Seymour Duncan Web site, the Pearly Gates humbuckers are “sweet, but slightly rude, with great sustain and a bright top end that make harmonics jump out of the guitar.” That’s exactly what Billy Gibbons does every time he picks up his ‘Pearly Gates.’ And now you can too. After all, it wouldn’t be a ‘Pearly Gates’ if it wasn’t for that “God-like voice” the original is so noted for. Attention to details can make or break any attempt at reproducing a masterpiece, and this certainly holds true for the new Billy Gibbons ‘Pearly Gates’ Les Paul from Gibson Custom. Take the all nickel hardware, or the lightweight aluminum string-over stopbar that lets you set up the strings just like Billy, or the gold top hat control knobs. There’s also the vintage style tulip tuners, and the one-piece mahogany neck with a medium 1959 rounded profile – ala Gibbons – and the same long-neck tenon found in every Les Paul Standard from Gibson’s Golden Era. Each ‘Pearly Gates’ is also equipped with period-correct CTS potentiometers and bumble bee capacitors to help achieve the legendary tone of the original. Are you starting to get the picture yet? Can you hear it? Is your heartbeat racing? Try to settle down … take a deep breathe and relax. Gibson Custom is known for its historic recreations of legendary guitars. 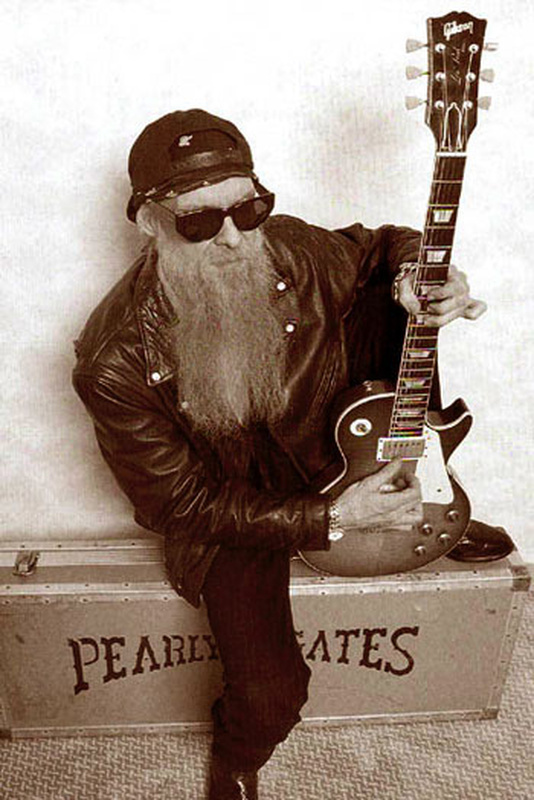 The Billy Gibbons ‘Pearly Gates’ Les Paul just may be its finest moment. You be the judge. Visit your nearest authorized Gibson Custom dealer and play one of these masterpieces. You know you want to. But you have to hurry. 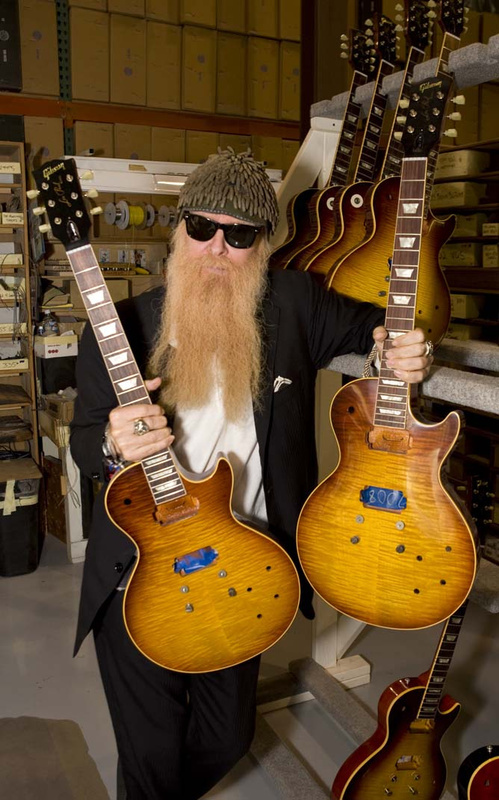 The Billy Gibbons ‘Pearly Gates’ Les Paul will be produced in a very limited quantity of only 350 guitars – 250 will receive Gibson Custom’s patented V.O.S. finish, 50 will be aged to look exactly like the original Pearly Gates, and another 50 will aged andpersonally signed and played by Gibbons himself. 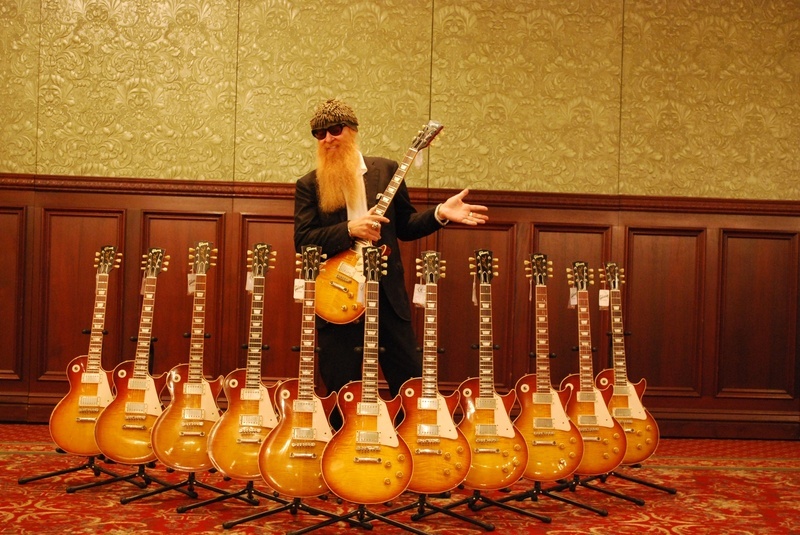 Each one will come with its own certificate of authenticity, and a Gibson Custom Les Paul hardshell case with Billy Gibbons’ signature silkscreened on the front. Once again, settle down. Take a deep breath and relax. And remember, we’re not responsible for what happens when you actually play one. This is one of the first 12 in this picture! From the first run!